“Victims are 3 Male Blacks and 1 Female Black – ages from 30-50 years old,” Moore said. “Tragically one is deceased. 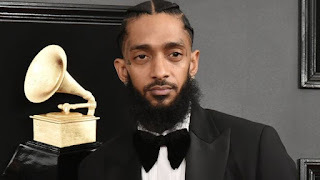 Hussle, an admitted gang member-turned-activist who tried to use his fame to help better the LA community, was honoured during a memorial service at the Staples Center before his procession — in which 21,000 people showed up. Most of the crowd took part in the 25-mile trip through his city and past his Marathon Clothing shop where he was gunned down. Thursday’s shooting comes just weeks after two people were reportedly hit by gunfire during an evening vigil for Hussle. It’s unclear what sparked the most recent incident.